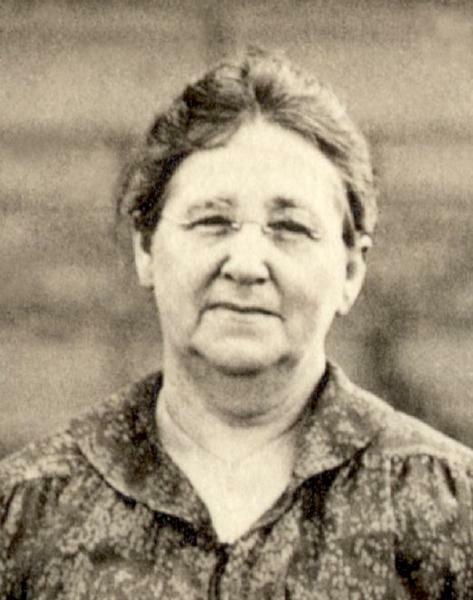 Katrina Franziska Kammerer was born on 11 February 1862 in Niagara County, New York. She was known as Kate. Johannes Kämmerer and Anna Elisabetha Dexheimer, appeared in the US federal census of 1 June 1870 in Suspension Bridge, Niagara County, New York. Other members of the household included Katrina Franziska Kammerer, Adam Kammerer, Susanna Kammerer, Jacob Andrea Kammerer, Philippina Kammerer, Anna Marie Kammerer and Helen Kammerer. Johannes Kämmerer and Anna Elisabetha Dexheimer appeared in the New York state census of 1 June 1875 in Niagara County, New Yoirk. Other members of the household included Katrina Franziska Kammerer, Adam Kammerer, Jacob Andrea Kammerer, Philippina Kammerer, Anna Marie Kammerer and Charles Otto Ernest Ford. While John, Elizabeth, Adam and Jacob "Kimmerer" are recorded at the bottom of page 51, daughters Phebe, Katie, Mary and Helen "Kimmerer" are enumerated 10 pages away at the top of page 62, appearing to be daughters of Daniel and Elizabeth Ott. She witnessed the marriage of Conrad Frank and Philippina Kammerer on 5 April 1883 in Buffalo, Erie County, New York, at St John's Evangelical Lutheran Church, 270 Hickory; Witness for the groom was John Gestenmeyer. She married Louis Eimer on 5 June 1883. Louis Eimer and Katrina Franziska Kammerer appeared in the US federal census of 1 June 1900 in Niagara Falls, Niagara County, New York, at 422 Fifth Street. Other members of the household included Louise Kammerer Eimer, Christiana Franziska Eimer and Paul Frederick Eimer. Louis Eimer and Katrina Franziska Kammerer appeared in the US federal census of 15 April 1910 in Niagara Falls, New York, at 422 Fifth Street. Other members of the household included Louise Kammerer Eimer, Christiana Franziska Eimer and Paul Frederick Eimer. The following appeared on 9 September 1913 in the Niagara Falls Gazette: At 6:30 o'clock this evening at the home of Mr. and Mrs. Louis Eimer of No. 422 Fifth street, will occur the marriage of their daughter, Louise Kammerer Eimer to Mr. John Guinther of this city. The house will be attractively decorated with flowers, and palms, and the ceremony will be performed before the mantel which will be banked with asters, ferns and hydrangeas. Rev. Herman Brezing, pastor of the Zion Lutheran church will officiate in the presence of a large number of relatives and friends. The bride will be gowned in white crepe meteor and Venetian lace, with cap of duchess lace. She will carry a bouquet of roses and lilies of the valley. Miss Lola Willis of Upper Sandusky, Ohio, who will be bridesmaid, will wear a gown of apricot messaline, veiled with pale blue chiffon, and will carry pink roses. Mr. Norman Ray of Massena, N. Y., formerly of this city, will be best man. The bridal party will enter the parlor to the strains of the wedding march played by Miss Helen Kammerer of this city, and Mr. George J. Barnett will sing, "I love you, dear." After the ceremony, a wedding supper will be served in a marquee on the lawn, and covers will be laid for ten at the bride's table which will be centered with a large wedding cake. Cut flowers will also form part of the decorations. After a wedding trip to the Thousand Islands, returning via the Adirondacks, Mr. and Mrs. Guinther will be at home at No. 422 Fifth street. Guests will be present from Toronto, Ont., Massena, N. Y., Ann Arbor, Mich., and Buffalo. She was a sponsor at the baptism/christening of Robert Louis Cooley on 12 November 1916 at Zion Lutheran Church in Niagara Falls, Niagara County, New York. Louis Eimer and Katrina Franziska Kammerer appeared in the US federal census of 1 January 1920 in Niagara Falls, New York, at 422 Fifth Street. Other members of the household included Paul Frederick Eimer. In January 1921, Katrina Franziska Kammerer was living in Niagara Falls, New York, at 422 Fifth Street cited in death notice of brother JA Kammerer, funeral at her home. Kammerer sisters Libby, Helen, Kate, Maggie, Phoebe and Mary were photographed together, possibly on the occasion of the death of their brother Jake in 1921. The Kammerer sisters and their sister-in-law Lucy Weiler Kammerer, posed for a photograph during the 1923 Kammerer family reunion. Katrina Franziska Kammerer died on 8 July 1928 at age 66 in Niagara Falls, Niagara County, New York, at Memorial Hospital. Louis Eimer became a widower at her death. The following appeared on 9 July 1928 in the Niagara Falls Gazette: Mrs. Katherine F. Eimer, 66 years old, died in Memorial Hospital at 1 o'clock yesterday, a few hours after she had been admitted to the hospital suffering from heart disease. She had been ill only two days. Born February 11, 1862, the daughter of John and Elizabeth Kammerer, pioneer residents of Suspension Bridge, Mrs. Eimer lived in this city all her life. In 1883 she was married to Mr. Eimer. Mrs. Eimer was a devoted member of the Zion Lutheran church. She had a wide circle of friends throughout the city. Besides her husband, she is survived by one son, Paul F. Eimer, and two daughters, Mrs. Louise E. Guinther and Mrs. Christie E. Cooley, all of this city. Five sisters also survive. They are, Mrs. Margaret Borth, Buffalo; Mrs. Charles O. Ford and Mrs. A. J. Hoffman, of this city; Mrs. Cornelius Frank, Devil's Lake, N. D. and Mrs. Elizabeth Barnett, of Buffalo. There are three grandchildren, George Henry and Robert Louis Cooley and John Paul Guinther, of this city. The funeral will be held from the family home, 422 Fifth street, Wednesday afternoon at 2:30 o'clock, the Rev. Herman Brezing of the Zion Lutheran church officiating. Burial will be in Oakwood Cemetery.